In addition to their low sensitivity, two major limitations of LFAs are related to the requirement of samples poured directly onto the (exposed) sample pad, which can be dangerous, especially for handling of hazardous samples, and to the fact that they can only handle small volumes (typically 200 microliters) of sample per analysis. Given the aforementioned context, we propose a new, paper and gold nanoparticle-based lab-in-a-syringe (LIS) device. It employs a simple vertical-flow immunoassay (VFIA) that operates simultaneously to sampling. By inserting the conjugate pad and detection pad inside plastic cartridges that can be connected to a syringe, we are able to minimize handling of the sample by the operator and expand the volume of sample that can be analyzed (up to 5 milliliters), thereby making the device safer and more sensitive than similar tools (Figure 4). Like most other paper-based diagnostic devices, our new LIS is easy to use and fast, providing a read out in less than 10 minutes. We demonstrate its applicability for the detection of PSA in real human urine samples at clinically relevant concentrations. Beyond this clinical proof-of-concept application, our LIS has enormous potential for applications in fields such as food control, safety and security, and environmental analysis. The principles of an indirect ELISA assay are also applied in a novel design for signal enhancement in LFAs. Secondary antibodies are included in the conjugate pad and applied for the detection of amplified Leishmania infantum DNA extracted from dog blood. The polyclonal nature of such antibodies allows their multiple connections with primary ones, giving rise to the enhancement of the AuNP signal in the test line and consequently the sensitivity of the assay is highly increased. 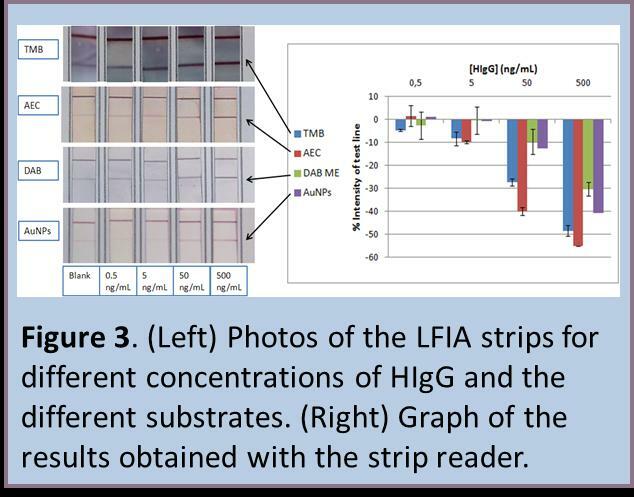 The use of labelled primers in the DNA amplification procedure allows to obtain double labelled (FITC/biotin) amplified DNA products that can be detected in a LFA., allowing to detect up to 0.038 parasites per DNA amplification reaction (1 parasite/100mL of DNA) (Figure 5). In our group it has been reported an easy-to-use, low cost, and disposable paper-based sensing device for rapid chemical screening with a smartphone readout. The device comprises luminescent graphene quantum dots (GQDs) sensing probes embedded into a nitrocellulose matrix where the resonance energy transfer phenomenon is applied as the sensing mechanism (Figure 8A). The GQDs probes were synthesized from citric acid by a pyrolysis procedure, further physisorbed and confined into small wax-traced spots on the nitrocellulose substrate. The GQDs were excited by an UV LED powered by a smartphone which is used as both energy source and imaging capture. 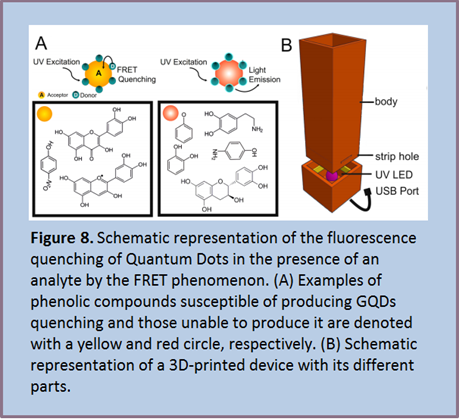 The LED was contained within a 3D-printed dark chamber that isolates the paper platform from external light fluctuations leading to highly reproducible data (Figure 8B). The cellulose-based device was proven as a promising screening tool for phenols and polyphenols in environmental and food samples, respectively. It opens up new opportunities for simple and fast screening of organic compounds and offers numerous possibilities for versatile applications. It can be especially useful in remote settings where sophisticated instrumentation is not always available. 1. Claudio Parolo, Arben Merkoçi, “Paper based nanobiosensors for diagnostics”, Chem. Soc. Rev., 42, 2013, 450-457. 2. Adaris M. López-Marzo, Arben Merkoçi, “Paper-based sensors and assays: a success of the engineering design and the convergence of knowledge areas”, Lab Chip, 16, 2016, 3150-3176. 3. 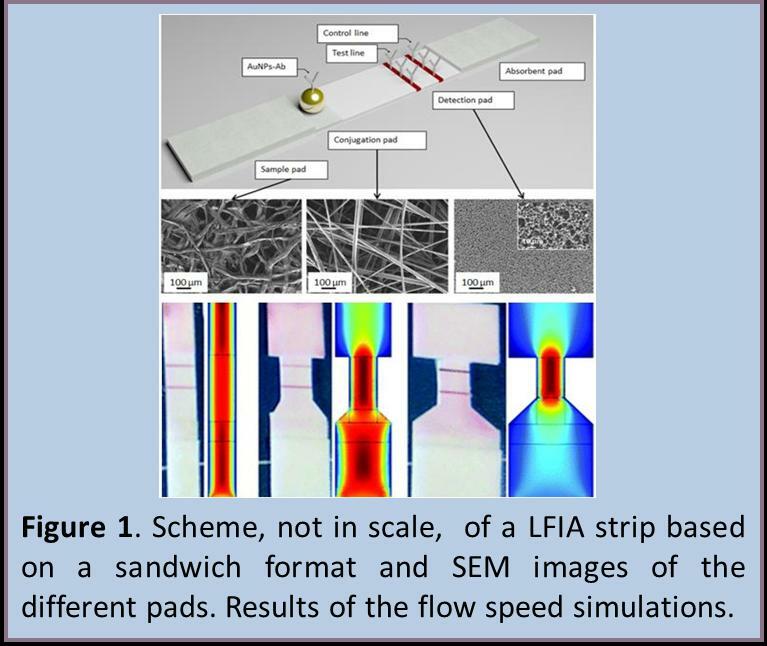 Daniel Quesada-González, Arben Merkoçi, “Nanoparticle-based lateral flow biosensors”, Biosensors and Bioelectronics, 73, 2015, 47–63. 4. Claudio Parolo, Alfredo de la Escosura-Muñiz, Arben Merkoçi, “Simple paper architecture modifications lead to enhanced sensitivity in nanoparticle based lateral flow immunoassay”, Lab Chip, 13, 2013, 386-390. 5. 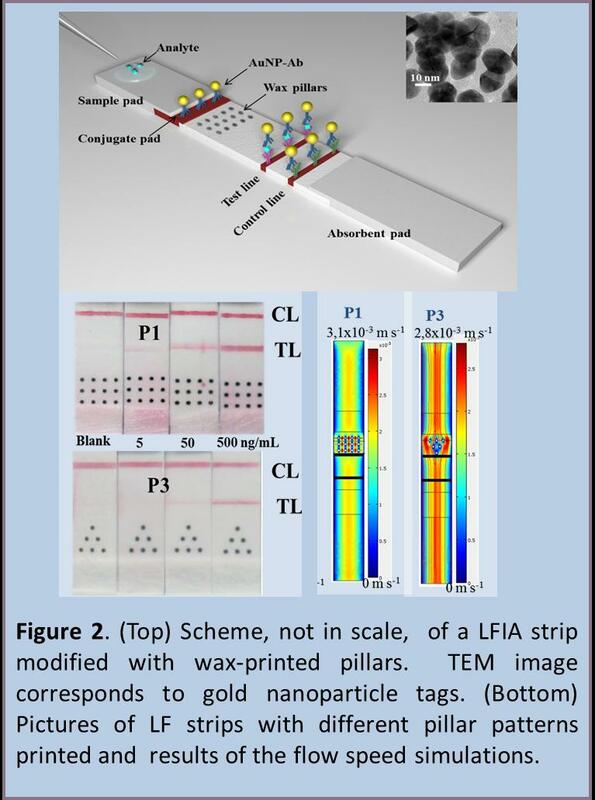 Lourdes Rivas, Mariana Medina, Alfredo de la Escosura-Muñiz and Arben Merkoçi, “Improving sensitivity of gold nanoparticles-based lateral flow assays by using wax-printed pillars as delay barriers of microfluidics“, Lab Chip, 14, 2014, 4406-4414. 6. Claudio Parolo, Alfredo de la Escosura-Muñiz, Arben Merkoçi, “Enhanced lateral flow immunoassay using gold nanoparticles loaded with enzymes”, Biosens. Bioelectron., 40, 2013, 412-416. 7. 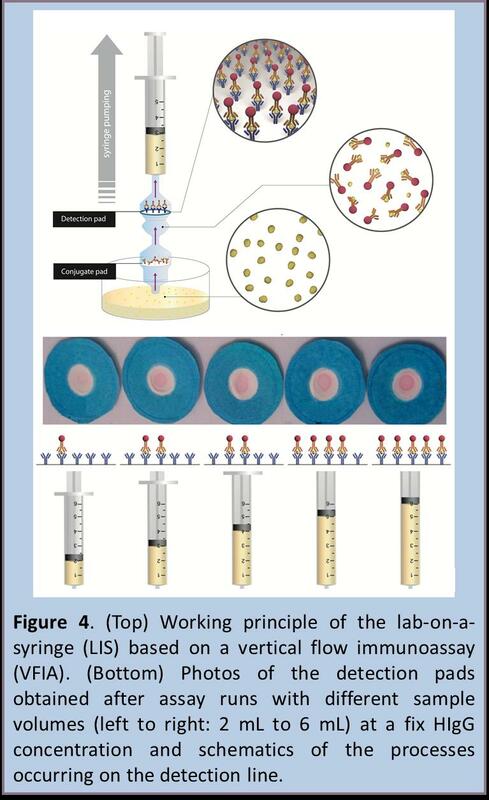 Gisele Elias Nunes-Pauli, Alfredo de la Escosura-Muñiz, Claudio Parolo, Ivan H. Bechtold, Arben Merkoçi, “Lab-in-a-syringe using gold nanoparticles for rapid immunosensing of protein biomarkers”, Lab Chip, 15, 2015, 399-405. 8. Lourdes Rivas, Alfredo de la Escosura-Muñiz, Lorena Serrano, Laura Altet, Olga Francino, Armand Sánchez, Arben Merkoçi. “Triple lines gold nanoparticle-based lateral flow for enhanced and simultaneous Leishmania DNA detection and endogenous control”, Nano Research 2015, Volume 8 (11), 3704-3714. 9. Eden Morales-Narváez, Hamed Golmohammadi, Tina Naghdi, Hossein Yousefi, Uliana Kostiv, Daniel Horak, Nahid Pourreza, Arben Merkoçi.“Nanopaper as an optical sensing platform“, ACS Nano, 9, 2015, 7296-7305. 10. Hamed Golmohammadi, Eden Morales-Narváez, Tina Naghdi, Arben Merkoçi. “Nanocellulose in Sensing and Biosensing”, Chem. Mater., 2017, 29 (13), 5426–5446. 11. B. Heli,E. 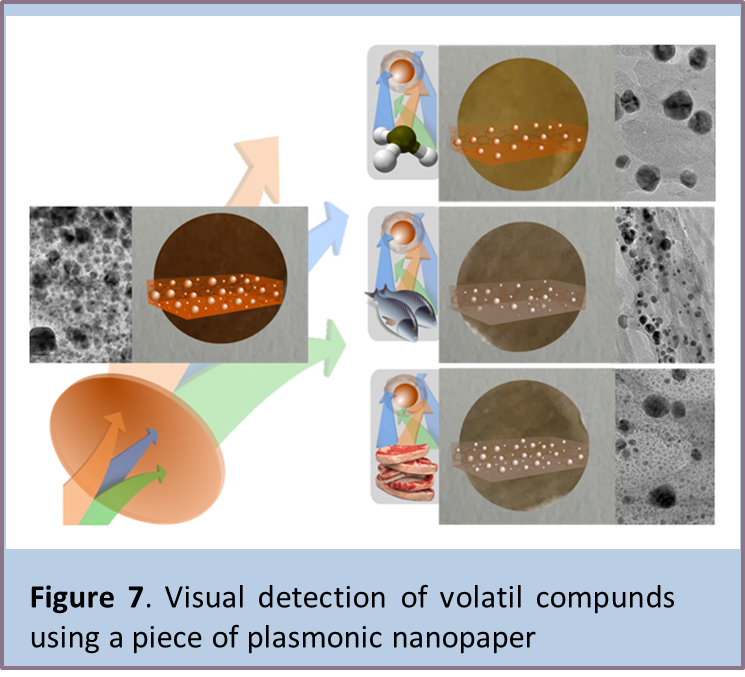 Morales-Narváez, H. Golmohammadi, A. Ajji and A. Merkoçi, “Modulation of population density and size of silver nanoparticles embedded in bacterial cellulose via ammonia exposure: visual detection of volatile compounds in a piece of plasmonic nanopaper“, Nanoscale, 2016, 8, 7984. 12. Jahir Orozco, Ruslan Álvarez Diduk, Arben Merkoçi, “Paper strip-embedded graphene quantum dots: a screening device with a smartphone readout”, Sci. Rep., 2017, 7 (976).